Traditionally stained glass was always manufactured using small pieces of glass fixed together with a ‘H’ lead strip and soldered to keep the glass pieces together. Think of it like a jigsaw being held up vertically. 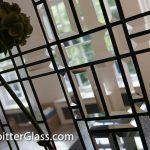 Although this procedure is sometimes still used today, the modern Overlay Stained Glass is a more popular and versatile product. 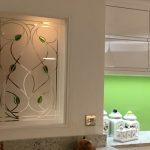 Our Overlay Stained Glass is created by applying lead strips to both sides of a sheet of toughened safety glass with the Overlay Stained Glass Colours located on one side of the glass under the leaded strips. If required, our leaded glass panels can be supplied as double glazed units with the leadwork being located on the outer leaf of the double glazed unit. This would not be possible using the older method. 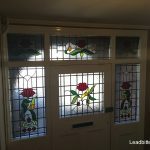 The door set (pictured right) was created for a client in Bedford and we manufactured it using our traditional materials to create an authentic looking stained glass door with the added benefits of using toughened glass double glazed sealed units with excellent energy saving properties. You can see more images and a description of the job by reading this article. 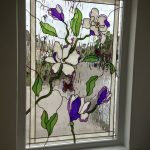 As mentioned above, one big advantage that Overlay Stained Glass has over the traditional method is that toughened glass can be used to create beautiful glass designs along with lead strip and transparent or marbled overlay colours. 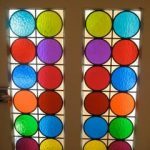 These durable and attractive materials produce a beautiful effect that lasts and when done correctly, it can be unrecognisable from the traditional stained glass method. When using natural lead strip, our decorative glass artists can solder the joints and age the lead to give the glass that old stained glass look. Soldered leadwork costs extra so please request a quote for this. Using Minster glass as the decorative leaf of the double glazed sealed unit gives the panel that old ‘mottled’ appearance that some people say is a lot more attractive than the flat modern and shiny look of standard flat glass. 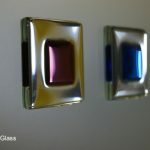 As you can see by this picture of this 1930’s glass design, the coloured areas of the glass are not flat and all of the colours are textured the same as the clear areas of the design. 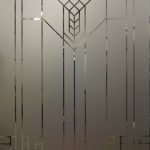 Other textured glass patterns can also be used to create leaded glass panels and popular glass patterns include Stippolyte glass and Flemish glass from our Frosted Glass page. All textures can be used as the ‘backing glass’ to the double glazed unit but only a few textures can actually be used to create the decorative leaf of the sealed unit. Not only does toughened glass have a lot of security benefits, using toughened glass also helps preserve the costly leaded glass design. 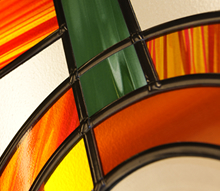 What are the benefits of Overlay Stained Glass? 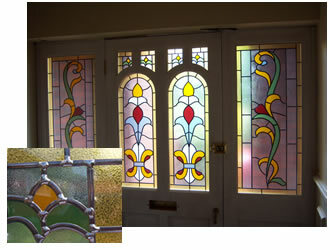 The modern procedure has many advantages over the older stained glass technique. 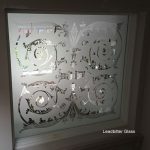 Energy saving is a big concern in todays world and with the stained glass design being manufactured as a stained glass overlay onto a solid sheet of tougehed glass, this reduces the possibility of the cold weather coming into the home through the joints of the design. Modern stained glass can also be applied directly onto energy saving Pilkington K Glass and this glass is now a building regulations requirement for every new window and door installation. 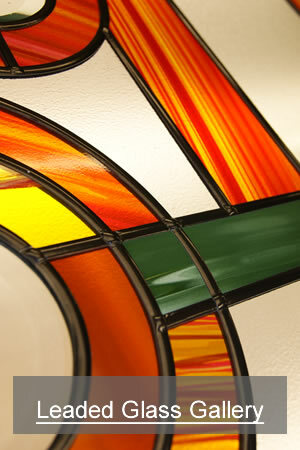 Durability and security are another advantage with the modern day stained glass technique. 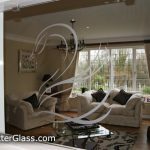 Applying the design directly onto toughened glass provides long lasting and secure decorative glass. In the past people have paid thousands of pounds for the old stained glass product only to find that small coloured sections of the design have cracked within weeks. This cannot happen with our product. There are literally hundreds of overlay colours to choose from for use in the modern day stained glass and most colours can be combined with a frosted overlay (as above) to create an even larger range of colours and textures. Lead strip also comes in many colours and effects with the old favourite through the 80’s and 90’s being natural lead colour. Today almost every job we create is manufactured using antique lead which is a dark brown or almost black in colour. Leadbitter Glass now offers antique lead on request but other lead colours such as natural, silver and gold can also be used. 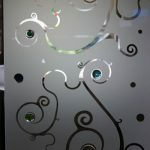 Soldered joints on the lead strips help achieve that ‘traditional’ feel to the glass design and this finish can be requested for any leaded glass panel that we create. 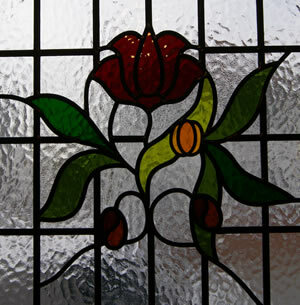 You can see the different Lead strips available in our Leaded Glass Options page. 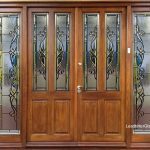 The Stained Glass Roundels pictured above are manufactured using coloured glass and they are a beautiful modern day reproduction of the popular glass features that are included in many traditional door designs from the Victorian and Edwardian era’s. Our 60mm diameter glass Roundels are available in red, yellow, blue, green and clear glass. 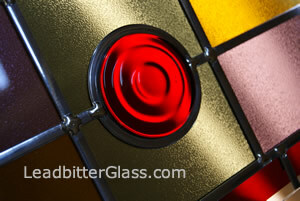 View our basic range of Overlay Stained Glass colours to view the popular colour choices. There are hundreds of other colours and effects available so you can request any colour you find on any design throughout this website.